This year, I taught pretty much nothing but poetry. In first semester, Latin class was the Latin verse epistle — Horace, Ovid, Ausonius, Sidonius. In English translation was Latin epic — Virgil, Ovid, Lucan, Claudian. In second semester, Greek class was Theocritus’ Idylls. In English translation was classical mythology — Hesiod’s Theogony and selections from his Works and Days; Aeschylus’ Prometheus Bound and Agamemnon; Sophocles’ Oedipus the King and Antigone; Euripides’ Hippolytus; some Pindar; selections from Homer’s Iliad and Odyssey; some of Virgil’s Georgics and Aeneid; some of Ovid’s Metamorphoses and Heroides; several Homeric Hymns; a bit of Prudentius and Nonnus — the prose was largely from Apollodorus and Livy. This is a lot of poetry. And teaching ancient poetry draws you not only to a given poet’s wider corpus (that is, those poems of Horace, Theocritus, Ovid, et al. not covered in class) but to the intertexts, one way and the other. Theocritus makes you cast you eye back to Homer but also forward to Moschus, Bion, and especially Virgil’s Eclogues. 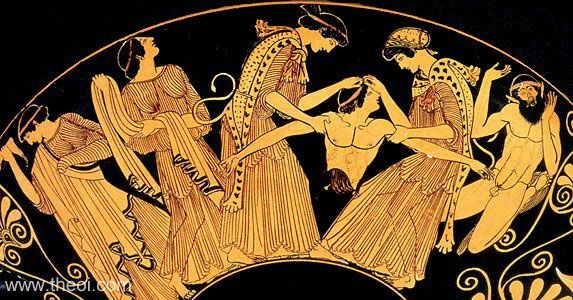 Teaching the story of Pentheus, whether from Ovid’s Metamorphoses or Apollodorus’ Library, brings the mind circling back to Euripides’ Bacchae. Reading about Polyphemus in Theocritus, Idylls 6 and 11, brings you not only to Homer but to Ovid’s Metamorphoses and Euripides’ Cyclops. Herakles and Hylas in Idyll 13 drives you inevitably to Apollonius’ Argonautica. Any reference to Peleus or Thetis makes me think of Catullus 64. Teaching epic makes me want to read more epic — not just, say, Statius’ Thebaid but the Mahabharata or Ramayana as well, besides rereading all of Homer. So on it will continue to go. Teaching poetry and reading poetry — there is no end. And my mind now moves to research. I am currently examining two of Leo’s letters as sources for post-Roman social history. It is an interesting topic and has its own appeal. But all this poetry filling up my mind and heart — it makes me want to write about poetry! Maybe a study of Statius? Or perhaps start somewhere smaller — Ambrosian hymns? Rutilius? Whatever the poetry is, it will have to be late antique. And, although Rutilius is great, probably Christian, since the intersection of later Latin literature and ancient Christianity is where my research strengths currently lie. Venantius Fortunatus, maybe? Arator? I could bring both philology and theology to bear on these texts, hopefully in a fruitful way. But for now — Vandals in Africa. This entry was posted in Ancient World, Christianity, Classics, History, Literature, Mythology, Patristics and tagged ancient poetry, classical poetry, poetry, teaching, teaching poetry on April 9, 2019 by MJH. Today I gave my final lecture of Greek and Roman Mythology, ‘Myth Today’. I spent a lot of it talking about the use of classical mythology in popular culture — Wonder Woman, Star Trek, Eric Shanowar’s Age of Bronze, the work of Neil Gaiman — and how harnessing a mythological framework enables one to tell a story with wide consequences that broaden the audience’s vision and challenge their assumptions, much as science fiction and fantasy do. Indeed, this is one of the reasons we keep going back to classical mythology, whether it’s the retelling and reshaping them for our own era (Hercules: The Legendary Journeys or Assassin’s Creed: Odyssey) or drawing inspiration from them (possibly Battlestar Galactica, T S Eliot, The Wasteland). my general critical position … revolves around the identity of myth, along with those of folk tale, legend, and related genres, continue to form the structures of literature. 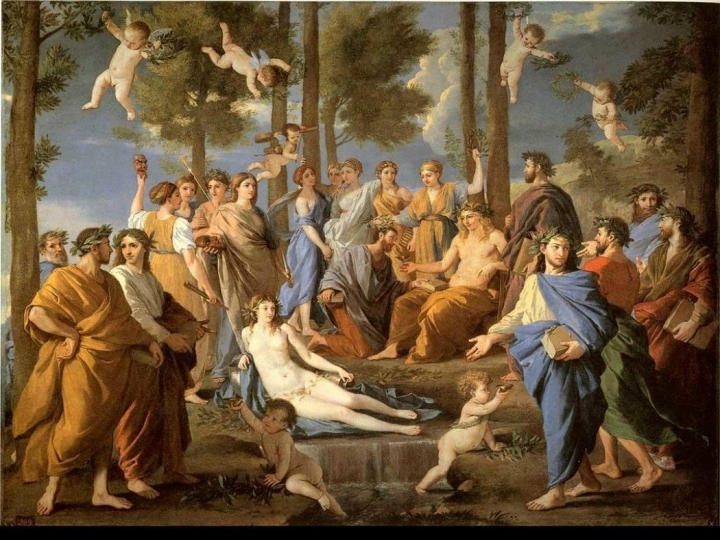 Classical mythology, to an anglophone who grew up reading literature and watching TV and film and reading comic books that are part of an artistic heritage that constantly negotiates that past, is, along with the Bible, the basic grammar of story in the West. Frye, of course, is pushing us farther than this, pushing us up into the transcendent. And so in poetry, and in mythology, we find ourselves drawn further up and further in to something different and bigger than a simple materialistic world where A always = A, but can also = alpha or even be transmuted into something completely different. Is this, therefore, a means by which the very act of storytelling, or the labour of versification, is itself a means of communicating with the numinous? The numinous is where I find myself at the end of my myth course. What did the Greeks and Romans get out of their common stock of stories, from Homer through Ovid to Nonnus of Panopolis and Fulgentius the Mythographer? What is it that is intrinsic to these stories that drives us to them again and again, compelling us to read them? Is it because they give us a brush with Something Bigger? I had two minutes, so these were things that were left unsaid. But I do still want to push these boundaries. This entry was posted in Ancient World, Books, Classics, Literature, Mythology, Words and tagged all literature is mytholoogy, greek and roman mythology, myth and reality, myth today, mythology, northrop frye, owen barfield, poetic diction, samuel taylor coleridge, words with power on April 3, 2019 by MJH. I once heard an anecdote about a colleague who (I think) said that Constantine’s revisions of the imperial postal system were more significant than his conversion to Christianity. This may, in fact, be true, depending on how you define your terms. However, it is the case that, overall, coming to grips with Christianity will help you understand late antiquity better than knowing the imperial postal system. If you begin with the Tetrarchy and Diocletian, you will need to have some grasp of who Christians are and why the Roman government disliked them for understanding the persecution. If you begin earlier with the Third Century Crisis and are interested in Latin literature, the fact that we have so little Latin literature from the second century will throw you into the arms of Cyprian of Carthage and his letters. And if you are interested in Later Latin Literature, Christianity is all over the place. Some of the greatest poets of Late Antiquity write explicitly religious poetry. It would be a shame to study the world of late antiquity (to cite the title of a Peter Brown book) and miss out on Prudentius and the other Christian epicists. Likewise the Greek verse of Gregory of Nazianzus, or the sublime Syriac poetry of Ephrem and his luminous eye (to cite a Sebastian Brock title). While the rise of western Christendom (to cite Peter Brown again) is a major feature of the study of the Mediterranean world in Late Antiquity (Averil Cameron this time), I admit one should be perspicacious. There is a lot to grapple with. Consider the realm of texts: Augustine of Hippo is the ancient Latin author with the largest surviving corpus, for one thing. We have more Christian letter collections from Late Antiquity than the non-Christian ones from preceding centuries. Indeed, Christians love books — sermons, letters, poems, long theological tractates, canon law documents, apologies, polemics, biographies, hagiographies, liturgies, and so forth, flow forth in abundance in Late Antiquity in Latin, Greek, Syriac, and Coptic. Material culture is also a big realm, from Spain and even Britain in the West to Mesopotamia in the East, the Roman Empire and its Persian neighbour has its fair share of physical remains, some of them the large, mosaic-encrusted churches of Ravenna, others the foundations of churches in Salamis on Cyprus. This is not to mention the myriad smaller objects of Christian origin — ivories, icons, Bibles, Bible covers, communion vessels, etc. Moreover, Christianity is a complex phenomenon. Are we looking at the beliefs and writings and practices of the educated elite? What about the urban poor? What about different modes of belief amongst different Christian bodies? Bishops? Laypeople? Rome? Antioch? Nisibis? In fact, there’s so much, whether you like Christianity or not, how could you help but take an interest in it if you’re interested in Late Antiquity? This entry was posted in Ancient World, Books, Christianity, Classics, Discover Late Antiquity, History, Literature, Patristics and tagged alan cameron, averil cameron, constantine, late antiquity, peter brown, san paolo fuori le mura, sebastian brock on March 18, 2019 by MJH. I recently finished teaching Theocritus, Idyll 10, to my Greek verse class. We are reading a selection of his poetry this semester, and it has been a pleasure. Idyll 10 is about two reapers, Milon and Boukaios. Boukaios can’t concentrate on his reaping because he is in love with a woman is away. Milon suggests that Boukaios sing a love song to make things go more quickly. After Boukaios is done, Milon changes his mind and tells his companion that working men should sing about hard things and focus on their jobs. It’s fitting to tell your hunger-inducing love to your mom as she lies in bed early in the morning. Your mom likes love poetry. This entry was posted in Ancient World, Books, Classics, Literature and tagged greek poetry, idyll 10, love songs, theocritus, your mom, your mom jokes, your mom likes love poetry on March 8, 2019 by MJH. Chancellor Gorkon famously said, “You have not experienced Shakespeare until you have read him in the original Klingon,” in Star Trek VI: The Undiscovered Country. It is a trope that is expressed about basically all literature — you cannot appreciate something in a translation. Something is always lost in translation, even if a translator is capable of conveying the same, precise meaning as the original text. One of the elements lost is the original aesthetic of the text. The sheer pleasure of reading well-wrought verbal artistry is entirely untranslatable. Anaphora, anacolouthon, assonance, alliteration, not to mention other devices that don’t begin with A are rarely, if ever, capable of reproduction in a translation. Puns are well-nigh impossible. Poetic meter and prose rhythm are almost inevitably sacrificed. I was reminded of this recently while teaching Theocritus. It has been a few years since I last read Theocritus in the original Greek, and I find myself enjoying him much more in Greek than I had in my more recent reading of him in English translation. The aesthetic pleasures of Theocritus are in some ways, of course, those of any poet. Reading dactylic hexameters aloud, for example, has an aural significance that nothing else provides (even things equally pleasant are simply different). And then you meet his use of literary devices — playing with words, repeating various sounds across several lines of poetry as a means of tying together the concepts in a poem in a way that English, with a different vocabulary, cannot do with the same meanings. There is also the pleasure of reading Doric Greek. Ancient Greek, if you were not aware, exists in multiple dialects. The dialect of Theocritus is primarily Doric. This means that he has certain versions of common words that different from other dialects — poti for pros, for instance. He also frequently uses long alpha where the Greek you learn in class uses eta. Some of his pronouns are different, etc. This use of a different dialect provides both an aesthetic and philological pleasure. His Greek ‘sounds’ different from Homer’s, although he does use some Homeric vocabulary and forms; it sounds different from Plato’s, as well. Finally, part of the pleasure of reading verse written in inflected languages is the fact that word order matters a lot less than in English. As one of my students calls it, every once in a while Theocritus gives us a ‘Happy Grammar Fun Time’ — he will delay a crucial word in a sentence through enjambment so that it is both the final word of the sentence and the first word of a line of poetry. Not only this, in one of the occasions he does this, that final word of the sentence is separated from the rest of the sentence by a refrain. Without the word, as you would read the sentence naturally, it has one meaning. Suddenly, a new meaning appears after the refrain. You cannot do this in English. It is hard to explain the sheer pleasure that comes from reading literature in its original language, but it is a truly pleasurable aesthetic experience to read Theocritus in Greek, or Virgil in Latin, or any author in the language he or she originally used. This entry was posted in Ancient World, Books, Classics, Grammar, Literature, Other Poetry and tagged ancient greek dialects, doric dialect, gorkon, greek language, greek literature, star trek vi, theocritus, translation on February 27, 2019 by MJH. Before I get going on this post, I feel obliged to state that I have loved teaching the “core” canon of Classics this year — in Latin: Horace and Ovid, in Greek: Theocritus, in English translation: Virgil, Ovid, Lucan, and a variety of Greek authors for Greek and Roman Myth (Hesiod, the tragedians, Homer, the Homeric Hymns, Apollodorus, et al, et al.). Nevertheless, teaching one’s own narrower focus brings with it a special pleasure all its own. Last term, I got to teach, as literature, a selection of Ausonius’ verse epistles to Paulinus in Latin class, and Claudian’s De Raptu Proserpinae in English in Latin Epic. For one week, all I taught was “later” Latin literature. I put “later” in quotation marks because very often, what we mean by “later Latin literature” ends in the Early Middle Ages, at which point Latin was still really only in middle age (ha). Anyway, it was an exciting week. First of all, Late Antiquity is where I have been most thoroughly invested for many years now. My research may range as late as the 1400s, and my background has certainly prepared me for teaching Aeschylus or the world of Augustan Rome, but the world, history, culture, and authors of Late Antiquity are where I am most comfortable. It is a pleasure to teach from a position of being comfortable with the context and the material in a deep way. Second, I can bring my research to bear on the texts. I can say that ‘such and such’ is a feature of later Latin without recourse to grammars or histories of Latin. I know it is because I have seen it with frequency in a number of different authors from the fourth through sixth centuries. I can comment on the piling up of superlatives, for example, as being part of contemporary courtesy. Amongst bishops, even your worst enemy is dilectissimus frater — ‘most beloved brother’. The third point is likewise related: I got to share with people the things I have learned, and that itself is a great delight. So I talked about how the quotation from Paulinus in Ausonius, about the names of different kings, is itself an example of the jewelled style (and pointed them to Michael Roberts, The Jeweled Style). I talked about how allusion works in these authors, and the kind of learned game they are playing with their readers, especially Ausonius (referencing Aaron Pelttari, The Space that Remains). Teaching Claudian, I got to talk about the prefaces and what they mean poetically and metapoetically, and this was great. There was a certain amount of allusion and intertextuality throughout it all (says my wife, ‘Don’t you lecture on that all the time?). The fourth point is pedagogical: I got to expand their idea of Latin literature. For the Latin students, they saw that grammar and vocabulary can remain ‘classical’ while style goes in new directions. They were thus given a window in both the difference and similarity of later Latin with its classical forebears. Most Latin students never read much of anything later than Apuleius (if that). Thus, they were exposed to a greater breadth of Latin than is usually on offer, and I think this will only help them, even if the rest of their lives they read nothing but ‘classical’ Latin authors. For the epic students, it was much the same. They got to see that Latin literature doesn’t just suddenly stop. Indeed, one of my wider aims throughout the course was tying together disparate strands of Latin and world literature. Not only did they read Virgil, Ovid, Lucan, and Claudian, they also had lectures talking about Livius Andronicus, Ennius, Statius, et al., and I tied in not only Latin epic’s relationship with Greek epic but also with themes in Gilgamesh and Mahabharata. In terms of reception, I brought Virgil to the early moderns. So Claudian was actually central to part of my wider pedagogy, which is: (although) Virgil is amazing (and you should know him), and these other epics area part of the same poetic tradition or human experience. The back of my Oxford Classical Text of Ausonius boasts that there are over 100 volumes in the series. Later Latin literature, even when restricted to the later 100s to 800s, encompasses far more Literature than that. It’s worth introducing students to it. This entry was posted in Ancient World, Books, Classics, Literature and tagged aaron pelttari, ausonius, claudian, de raptu proserpinae, late antique latin, late antiquity, michael roberts, teaching, the jeweled style, the space that remains on January 21, 2019 by MJH. In 2018, I finished reading 56 books that were not picture/story books or board books. I do not know how many picture/story books and board books I read. My son owns 49 board books; I have read all of them multiple times this year. Of the non-board book picture/story books, I read 36, but we have more that I did not read. And there are the library books, books at other people’s houses, books at churches that I read along the way. As usual, a book that I completed means that I finished the entirety of that which is bound between two covers. Some are books that I started before 2018. And many texts and books were read that were not read in toto. For example, none of Leo the Great’s letters are here because I did not read any of them bound together as a single volume. And many articles, poems, and other non-books were read. The first book I completed was The Fragmentary Classicising Historians of the Later Roman Empire, Vol. 1 by R. C. Blockley. This is the introductory volume, not the texts with translation. The final book I completed was volume one of the Loeb Classical Library edition of Claudian, ed. and trans. Maurice Platnauer. Medieval texts in translation: 3, unless we count Pseudo-Dionysius and Justinian as medieval, then subtract two from ‘ancient’ and ‘patristic’, then add them to medieval. I turned 35 this year. The 35th book I finished was Mayer’s commentary on Horace, Epistles, Book I. There are fifty-two weeks in a year. The fifty-second book I finished was The World of Medieval Monasticism by Gert Melville. I read another history of monasticism, The Story of Monasticism by Greg Peters. Melville’s is better in my opinion, but Peters’ is probably better for normal people. Half of 56 is 28. The 28th book was Seamus Heaney’s translation of Aeneid, Book VI — I really, really liked it. The rereads were The Lord of the Rings, read as three volumes (so counted as three books) and A. D. Melville’s translation of Ovid’s Metamorphoses. I also reread the Aeneid, but this was my first time reading Frederick Ahl’s translation and Seamus Heaney’s translation of Book VI. The most-read author was J. R. R. Tolkien (4) followed by Andrew Louth (2) and Dayspring MacLeod (2). This was the year I finally read The Silmarillion and Pride and Prejudice. This entry was posted in Ancient World, Books, Christianity, Classics, History, Literature, Mediaeval, Patristics, Science Fiction and Fantasy and tagged 2018 in review, books, lists, reading on January 1, 2019 by MJH.